Be part of a group that champions gender-fair education, civil rights, legislative action in support of equity and so much more! A free AAUW membership! AAUW members can give a free national AAUW membership to any recent graduate – a friend, daughter or son, granddaughter or grandson, niece or nephew. It’s free to you and to your loved one. ELIGIBILITY A graduate holding an associate or equivalent (RN) or higher degree from a regionally accredited institution. Dual Members. This is a member who holds membership in more than one branch. Membership ($59) is paid through one branch considered the primary branch. Branch dues are paid to each branch unless a life member. $56 is tax deductible. National Members (formerly Members-at-Large). A national member pays dues directly to AAUW ($59) and is not affiliated with a branch. $56 is tax deductible. 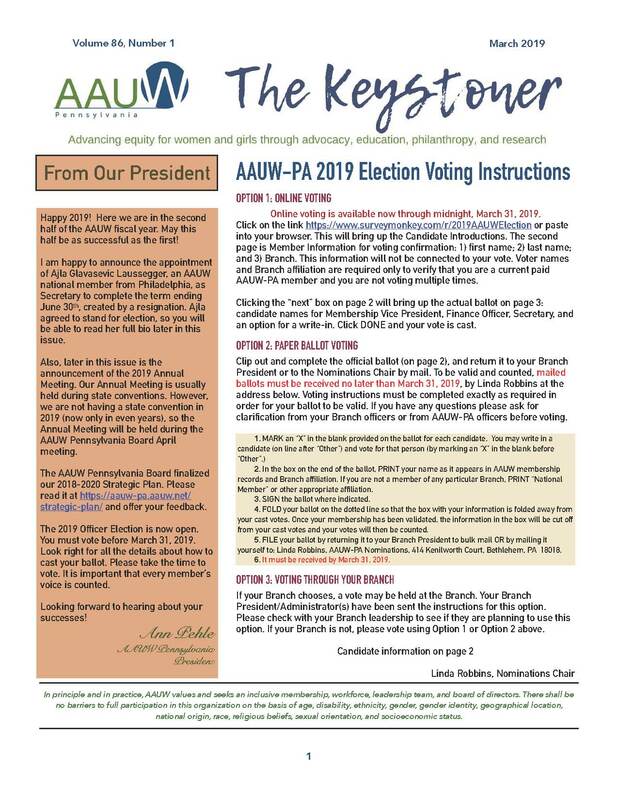 National members may join AAUW-PA by paying the $10 dues to receive the Keystoner and be invited to state meetings. These state memberships must align with the fiscal year, not the anniversary dates used by national. E-Branch. National members, members of disbanded branches, as well as members in unique living situations, can remain connected or become involved with AAUW-PA. These members can choose to form an e-branch which only requires three (3) members and some knowledge of the internet. Contact social media chair AAUW-PA for more information. Paid Life Members. A paid life member has paid a one-time payment of 20 times the current AAUW dues. The member is required to pay branch and state dues. Honorary or 50-Year Members. A member who has paid AAUW dues for 50 years is eligible for Honorary life membership. The 50 years do not need to be consecutive. No dues are required of state, but a branch may or may not choose to collect branch dues. The branch needs to submit an application to AAUW. Go to www.aauw.org; click on the following: Member Center, Membership Campaigns, 50 year Honorary Life Membership, then General Forms. College/University Membership. AAUW’s College/University Membership Program provides educational institutions the opportunity to easily share all the benefits of AAUW with their students, faculty, and staff. Undergraduate and graduate students at a C/U member school: AAUW dues are FREE; state dues are FREE as long as the student is enrolled in college; branch may or may not collect dues. Undergraduate and graduate students at a school that is NOT a C/U member: AAUW dues are $18.81; state dues are FREE as long as the student is enrolled in college; branch may or may not collect dues. As an Emerging Leader Intern (ELI), a branch may choose to pay AAUW dues. Give a Grad a Gift. Only an AAUW member can give a recent graduate—one within two years– a gift of a FREE AAUW membership at $59; $46 is tax deductible. THIS IS AT NO COST TO THE MEMBER OR GRADUATE. If the graduate decides to join a branch, the state and local dues need to be paid by the graduate. The membership gift can occur through the branch or by completing the form on-line, www.aauw.org; click on the following: Member Center, Membership Campaigns, Give a Grad a Gift, then General Forms. Shape the Future Events. At mission-driven events open to the public, discounts will be offered to prospective members or two-year lapsed members, and free memberships offered to a branch. The discount of ½ AAUW dues ($29.50) and ½ state dues ($5) is offered to a person who joins on the spot; branch dues may or may not be waived. One free membership for every two new members who join, with a maximum of three, will be offered to the branch and must be redeemed by the end of the AAUW fiscal year in which it was earned. THIS RESOURCE IS A SUMMARY OF INFORMATION WHICH CAN BE ACCESSED AT www.aauw.org BY TYPING “LEADER ESSENTIALS” IN THE SEARCH BOX. .. where branches can learn from each other….